I wish they'd do that to parks here in Toledo! I'm sure Mr. H would agree. Ooh... I (heart) Nessie! The bigfoot one creeps me out...but YAY NESSIE!!! 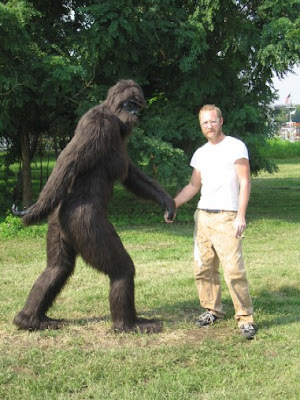 I should make a model of Bigfoot and put it on the shoulder of the busier road by my house. Then I could stand behind it and watch people's reactions. YES! Cool! *sigh* I. Want. One. That is such a cool idea, Patsee! I thought it was supposed to be real too! totally awesome - must get to brooklyn soon! wow! new york is so cool! but what would be really cool is if they made a unicorn! i heart unicorns, and collossal squid! I wonder how much papier mache it would take to make a sasquatch. They're making a movie about the Loch Ness Monster called The Sea Horse! You should check it out! know dolphins talk? I'm fluent! Yah-ee sque? Agh! Have you read Pride and Prejudice, and if so, did you get the names for a couple of people in Kiki Strike from there? I thought you might've 'cause of Principal Wickham and Mrs. Young. now THAT would be a fun art prodject! "create a life-size sculpture of a mythical beast of your choice." Ha! im so doing that for school! that's so cool! and i too thought it was real at first. Random: when we were doing pottery in art class, I made a small statue of the Loch Ness monster. I also made a crystal ball stand, hoping to someday have one to tell the future with. The teacher was confused by me. Cupcakedoll: You've come to the right place! Your special skills will certainly be appreciated here. Wow!!! 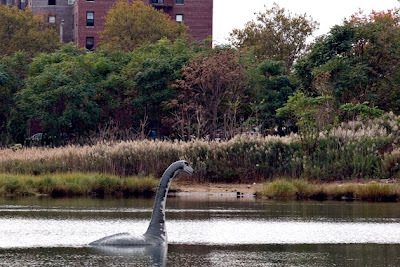 I luv nessie, did you know that the famous picture of Nessie was a fake?